Each player must send 1 card from their hand to the GY to declare an attack. Toll Hike is a take on its Spell counterpart from years ago. Rather than pay LP which is easy to do, players have to give up a card to declare an attack. Far more costly as it is “send” and not “discard”, in Yu-Gi-Oh, the text details mean everything. This is a stall card for sure, as it can hurt some decks more than others. If you need monsters to be discarded or go to the grave via battle, this card is going to slow you down. If you need cards in the grave by any means, this could be a good card. I still think there are likely faster and better options than this. Snipe Hunter can do this with the added bonus of potentially killing your opponents monster. It is a good card and one that is better at slowing the game than its predecessor. A simple Continuous Trap Card today, Toll Hike takes a bad defensive option and makes it more annoying. Toll made you pay Life Points, Toll Hike makes each player send a card from their hand before declaring an attack. 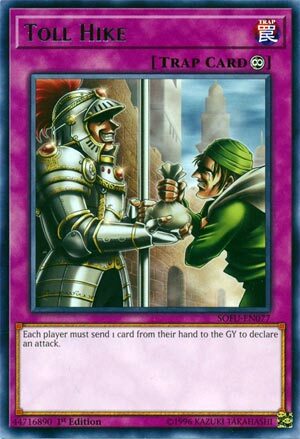 Defensive cards don’t win games, Stall Decks are boring, and this looks more like a bribe than a toll. In any case, you could just run Waboku and stall without worrying about its own destruction, monster destruction, and life point lost. Toll Hike is certainly better than Toll, but that is not saying much. Remember Toll? Yeah, well it seems like it was time to try and power creep that card, as if the game itself didn’t do that already, so here is Toll Hike. Toll Hike is a Continuous Trap Card that makes each player send a card from their hand to the GY to declare an attack. Not even discarding, so no Danger! effects, though that deck is likely FTKing you anyways now. Your hand is likely going to be a more limited resource over your life points, so it will be very annoying to give up card advantage just to try and push for game, just for your attack to get negated or something. This card is clearly designed for Stall Decks, and we all know how fun Stall Decks are. Still, a much needed improvement over Toll, thankfully this is a Trap though. Art: 2/5 I mean, Toll doesn’t have great artwork, what makes you think the retrain will improve on that so much better? Toll Hike (another continues Trap) is an upgrade of the Continuous Magic card Toll, from back in the set of Magic Ruler. The original Magic card Toll required a 500 Lifepoint cost for either player to declare an attack. Toll Hike requires each player to discard a card from their Hand in order to attack. So…what Decks can make use of this card…let’s see here. It’s a good Stall card and it certainly is an asset to players who are aggressive mill players (if you can last long enough to mill a win). Oh, and like yesterday, this would be an asset to the Thunder Dragon player as well. With all there discarding and cycling as well, this could be a really viable option. Any Deck that has even just a handful of cards that can be discarded for advantage, or even just cycled back to your Hand love this. I honestly feel it’d be a whole lot of fun to build a Deck utilizing this, and Toll too, and this could be a much bigger thing to deal with for a player if they happen to be using a Deck where they don’t keep a large Hand (which could prevent them eventually from attacking you) or a Deck that doesn’t rely or focus heavily (or at all) on having to discard things advantage wise, or at all. Art: 3/5 Strikingly similar, but it is a shown hike. The peasant looks the same, and the guard is definitely smiling, showcasing his greed in receiving a bag of money, as opposed to just a coin.